Social Psychological Foundations of Health and Illness is a summary of current research in social-health psychology. The chapters, written by distinguished leaders in the field, provide brief surveys of classic developments in each area of study followed by extended discussion of the authors’ research programs. Includes state-of-the-art descriptions of new findings and theories concerning social aspects of physical health and illness. Discusses virtually all of the major topics studied in the contemporary field of social-health psychology. Contains chapters written by leading figures in the field that discuss their own research within the context of classic efforts. Jerry Suls is Professor of Psychology at the University of Iowa. He has published more than 130 articles and chapters on social psychology and health psychology and is the author or editor of numerous books, including Psychological Perspectives on Self and Identity (edited with Abraham Tesser and Richard B. Felson, 2000) and Handbook of Social Comparison (edited with Ladd Wheeler, 2000). Kenneth A. Wallston is Professor of Psychology in Nursing at Vanderbilt University. He has published extensively on perceived control and health as well as on adaptation to rheumatoid arthritis. He is a member of the Executive Committee of the Society of Behavioral Medicine and has been the editor of the newsletter The Health Psychologist since 1993. 1. 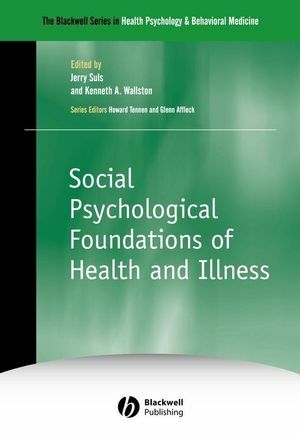 Introduction to Social Psychological Foundations of Health and Illness: Jerry Suls (University of Iowa) and Kenneth A. Wallston (Vanderbilt University). Part I: Models of Health/Risk Behavior and Behavior Change:. 2. Healthy Lifestyle across the Life-Span: The Heck with the Surgeon General: Howard Friedman (University of California, Riverside). 3. Exploring the links between risk perceptions and preventive behavior: Neil Weinstein (Cook College). 4. Communicating about Health: Message Framing, Persuasion and Health Behavior: Peter Salovey (Yale University) and Duane Wegener (Purdue University). 5. The Information-Motivation-Behavioral Skills Model: A General Social Psychological Approach to Understanding and Promoting Health Behavior: William A. Fisher (University of Western Ontario), Jeffrey D. Fisher (University of Connecticut), and Jennifer J. Harman (University of Connecticut). 6. A Social Reaction Model of Adolescent Health Risk: Frederick X. Gibbons, Meg Gerrard, and David J. Lane (all Iowa State University). 7. Affect, Thought and Protective Health Behavior: The Case of Worry and Cancer Screening: Kevin McCaul and Amy Boedicker Mullens (both North Dakota State University). 8. Social-Cognitive Factors in Health Behavior Change: Britta Renner (Ernst-Moritz-Arndt-Universitaet Greifswald) and Ralf Schwarzer (Free University of Berlin). Part II: Social-Cognitive Processes in Health:. 9. Common Sense Models of Illness: Implications for Symptom Perception and Health-Related Behaviors: René Martin (University of Iowa), Nan Rothrock (University of Iowa), Howard Leventhal (Rutgers University), and Elaine Leventhal (University of Medicine and Dentistry of New Jersey). 10. Contributions of Social Comparison to Physical Illness and Well-Being: Jerry Suls (University of Iowa). 11. Interpersonal Emotional Processes in Adjustment to Chronic Illness: Robert F. DeVellis, Megan A. Lewis, and Katherine Regan Sterba (all University of North Carolina). 12. The Social, Linguistic and Health Consequences of Emotional Disorder: James Pennebaker (University of Texas at Austin). 13. Affiliation, Social Support and Biobehavioral Responses to Health: Shelley Taylor (University of California, Los Angeles), Laura Cousino Klein (Pennsylvania State University), Tara L. Gruenewald (University of California, Los Angeles), Regan A.R. Gurung (University of Wisconsin), and Sara Fernandes-Taylor (University of California, Los Angeles). Part III: Personality and Health:. 14. Toward a Social Psychophysiology of Cardiovascular Reactivity: Interpersonal Concepts and Methods in the Study of Stress and Coronary Disease: Timothy Smith (University of Utah), Linda Gallo (San Diego State University), and John Ruiz (University of Pittsburgh School of Medicine). 15. Gender-Related Traits and Health: Vicki Helgeson (Carnegie Mellon University). 16. Self-Regulatory Processes and Responses to Health Threats: Effects of Optimism on Well-Being: Michael Scheier (Carnegie Mellon University) and Charles Carver (University of Miami). Part IV: Adaptation to Stress and Chronic Illness:. 17. The Influence of Psychological Factors on Restorative Function in Health and Illness: Ashley W. Smith and Andrew Baum (both University of Pittsburgh). 18. Coping and Adjustment in Rheumatoid Arthritis: Craig A. Smith, Kenneth A. Wallston, and Kathleen A. Dwyer (all Vanderbilt University). 19. Daily Processes in Health and Illness: Howard Tennen (University of Connecticut Health Center), Glenn Affleck (University of Connecticut Health Center), and Stephen Armelli (Pace University). 20. Scenes from a Marriage: The Coupling of Support, Coping and Gender within the Context of Chronic Illness: Tracey A. Revenson (City University of New York Graduate Center).